Ever since the events leading to Independence created our democracy, citizens of the United States of America have demonstrated their pleasure and disgust with government in an unrivaled expression of honesty, passion, patriotism, intellect and love for their country by exercising their right to vote. “Vote for Me and I’ll Set You Free: Works from the Collection of Lawrence B. Benenson” draws on historical documents, artifacts and works of contemporary art to create a kaleidoscopic view of the political process of voting and the role of the public and the artist in the political process. It touches on themes of aspirations, equality, justice, power, free speech, minority opinion and representation, hypocrisy and what it means to be part of the most fundamental aspect of the political process – the right to elect leaders – regardless of political orientation. The exhibition is being held at Omi International Arts Center, in Ghent, NY, through November 30, 2012. Highlights of the exhibition include an 1864 printing of the Emancipation Proclamation signed by Abraham Lincoln to raise funds for wounded Civil War soldiers. Other highlights include an early printing of the Constitution of the United States in The Connecticut Courant and Weekly Intelligencer. Printed less than two weeks after it was approved by the Constitutional Convention of September 17, 1787, ironically, at least to us today, the text of the Constitution is followed immediately by an advertisement offering a reward for a runaway slave. Also on view are the first engraving of the Declaration of Independence, from 1818, as Americans, newly nostalgic for first-generation patriotism following the War of 1812, wanted to document the country’s historic break from an oppressive colonial power. Later objects and works of art include important contributions by Modern and contemporary artists whose paintings, drawings and prints recognize the American dream and look at how it has played out in American society. Ben Shahn’s Sacco and Vanzetti and Their Guards (1931-1932) is a dignified portrayal of the anarchists who were convicted of murder and executed following a notoriously flawed trial. Saul Steinberg’s Truth (1959) illustrates the word of the title with the R inverted and all images reflected and upside down in a calm sea. 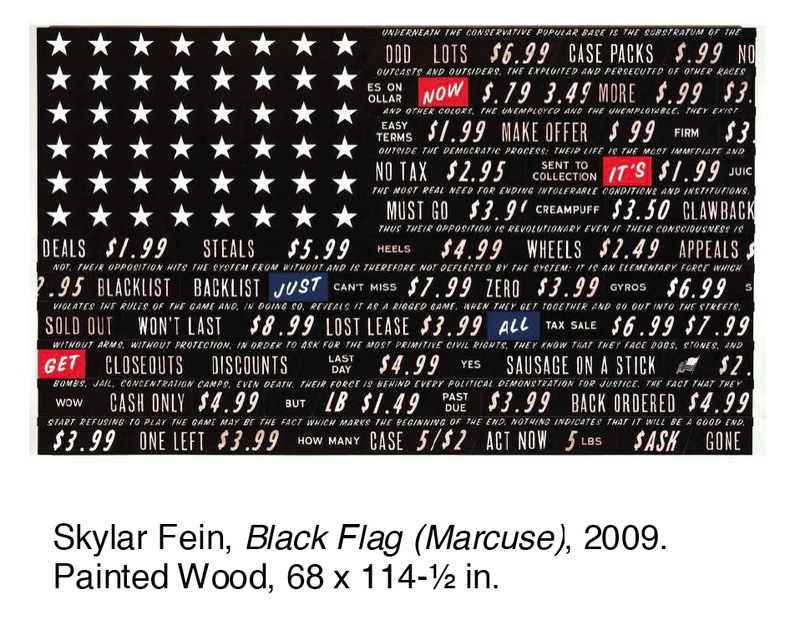 Skylar Fein’s Black Flag (Marcuse), 2009, re-imagines the American flag with alternating stripes. One set of stripes shows sale-price come-ons (“DISCOUNTS,” “WON’T LAST”) and the other social criticism by Herbert Marcuse. Neo-Conceptual artist Mark Lombardi’s 1999 Oliver North, Lake Resources of Panama c. 1984-1986 (4th Version) charts out in a five-by-almost-seven foot drawing/diagram the spheres of influence that ran through the Iran-Contra affair of the 1980s. Michele Pred’s 2005 Star Spangled Banner, is a mixed media work that creates an American flag out of razor blades that airport travelers surrendered to Transportation Safety Administration personnel. The works on view, collector Lawrence B. Benenson explains in a brief essay, “signify the beauty and the ugliness of humanity.” Throughout the exhibition, which is provocative and affirming and at the same time contains language and images not suitable for all audiences, including Black Panthers posters that use profane or racist derogatory language, the message is that numerous voices exist – and have for over two centuries – in the American political landscape. And however solemn or outrageous those voices are, each carries the same weight. The ability of Americans to determine the country’s political future comes through the act of voting. Just as loyalists in 18th century Maine sided with King George, racists in the mid-20th century sided with George Wallace and militants in the 1960s and 1970s sought power, it is up to the individual to determine the nation’s future. About Omi International Arts Center: Art Omi, as it is known colloquially, is a not-for-profit arts organization. Public programming includes exhibitions at the Charles B. Benenson Visitors Center and Gallery and the Fields Sculpture Park, a public exhibition space with nearly 80 contemporary sculptures shown on grounds that encompass 65 acres. (Bikes are available for visitors, and golf carts are available for handicapped visitors by reservation.) Art Omi also sponsors residency programs for international visual artists, writers, musicians, and dancers. Exhibition: “Vote for Me and I’ll Set You Free: Works from the Collection of Lawrence B. An exhibition of important cubist works by renowned Mexican modernist Diego Rivera was on view April 4 through July 25, 2004, at the National Gallery of Art, Washington, D.C., The Cubist Paintings of Diego Rivera: Memory, Politics, Place celebrated a significant but little-known Rivera painting of 1915, No. 9, Nature Morte Espagnole (No. 9, Spanish Still Life), a recent gift to the National Gallery from the estate of Washington Post publisher Katharine Graham. Organized by the National Gallery of Art, Washington, in collaboration with the Museo de Arte Moderno, Mexico City, the exhibition coincided with the Gallery's showing of the Courtly Art of the Ancient Maya. The Rivera exhibition then traveled to the Museo de Arte Moderno in Mexico City, where it was on view from September 22, 2004, through January 16, 2005. Rivera's work has been studied and shown in depth, yet his cubist period remains a less understood aspect of his career. The Cubist Paintings of Diego Rivera included some 20 works that demonstrate his distinctive approach to synthetic cubism--his use of complex structures of transparent planes, with a particular emphasis on sensory and memory association. The exhibition explored the intersection of history and the avant-garde at a key moment in the artist's development. The selection emphasizes the years 1914 and 1915, when Rivera was working in France and Spain. These works also illuminate the artist's deep engagement with themes of identity and place during a period that coincided not only with World War I but also with the most active period of the Mexican Revolution. incorporate objects that serve as emblems of Mexican identity: sarapes, petates (straw mats), an equipal (reed chair), and guajes (peasant gourds). The inclusion of Mexican motifs and Rivera's frequent use of the colors of the Mexican flag present a souvenir of his native land from afar, filled with revolutionary sympathy, nostalgia, and longing. Portrait of Martín Luis Guzmán (1915). 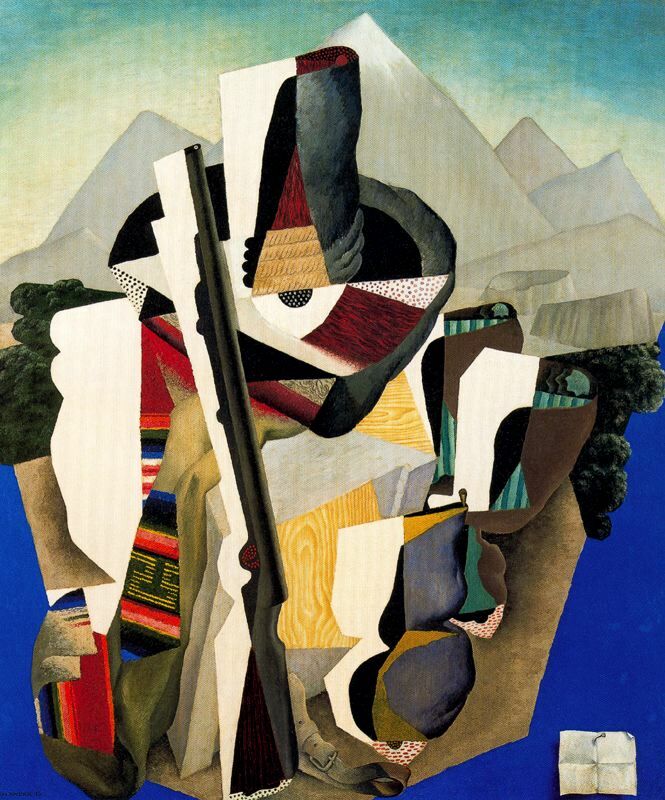 Together these paintings represent Rivera's finest cubist work and offer important meditations on self-identity and nationalism. The exhibition was organized by Leah Dickerman, associate curator, modern and contemporary art, National Gallery of Art, in consultation with Luis-Martín Lozano, director, Museo de Arte Moderno, Mexico City. The exhibition was accompanied by a fully illustrated brochure. Edward Hopper’s oil painting “Tredwell’s Folly” can be seen as an illustration of my grandfather, Dr Alonzo Tredwell (Doc), and a moment in his life on Monhegan Island in the early 1900’s. Doc Tredwell bought land on Monhegan Island on August 26, 1907. He built a house on it in 1908. It is adjacent to the house just above Lobster Cove that Rockwell Kent built for his mother also in 1908 (now owned by Jamie Wyeth). Hopper’s painting “Tredwell’s Folly” is part memoir, part family chronicle, and part history lesson. The background of the oil painting by artist Edward was explained to me by my grandmother (Doc’s wife) Ruth Tredwell. As a child I had spent many hours with her, learning about early Monhegan as an art colony, and the notable American artists who painted it. Years later, she gave me the Edward Hopper painting as a gift. Our house on Monhegan Island always seemed like a museum, filled with many artifacts and ephemera, which all chronicled my grandfather’s life while on Monhegan Island during the early 1900’s. In addition to other works of art and objects my grandfather had aquired on Monhegan, was the Edward Hopper painting, “Tredwell’s Folly.” The history of these items were especially fascinating to me, as I was curious about my grandfather, having never met him. He had passed away in 1933 when my father was still a small child. Ruth told me of Doc’s busy life in NYC, and how he had ventured off during summers to escape from the city and his busy medical practice. One summer in the late 1800’s while vacationing in Maine aboard a schooner, he came upon Monhegan Island and fell in love with its wild beauty and tranquility. He visited the island every summer, and eventually bought land in 1907 on Monhegan’s southern end known as Lobster Cove. He soon befriended Monhegan native and builder, Will Stanley. Together my grandfather and Will discussed how Doc would build his new Island home on Lobster Cove’s windy point, and how the house could be built to endure any storm and torrential winds. Will built a solid house, using extra large beams to hold up to any Maine storms and constant high winds. This gave reason to name the house “Four Winds”. A few years later, in 1919, Doc commissioned Will to build a dory for fishing. This dory was not as successful as the house Will had built Doc. In fact, the boat was named “Tredwell’s Folly.” It was truly a mistake to have Will, a house builder, act as a boat builder. The commissioned dory Will built was not at all seaworthy. Will wanted to make good on the deal by replacing Doc’s un-seaworthy dory with his own dory (as seen in Hopper’s painting). While the two friends stood by the beached dory on Monhegan’s “Fish Beach”, the discussion became tense, yet quiet and still. This scene was captured by artist Edward Hopper in the painting “Tredwell’s Folly.” Hopper knew Doc as the Island Doctor, and had reached out for help to treat an ailment earlier in the week. A few days after painting it, Edward Hopper headed up to Lobster Cove to visit Doc at Four Winds. Doc greeted the artist at the door. 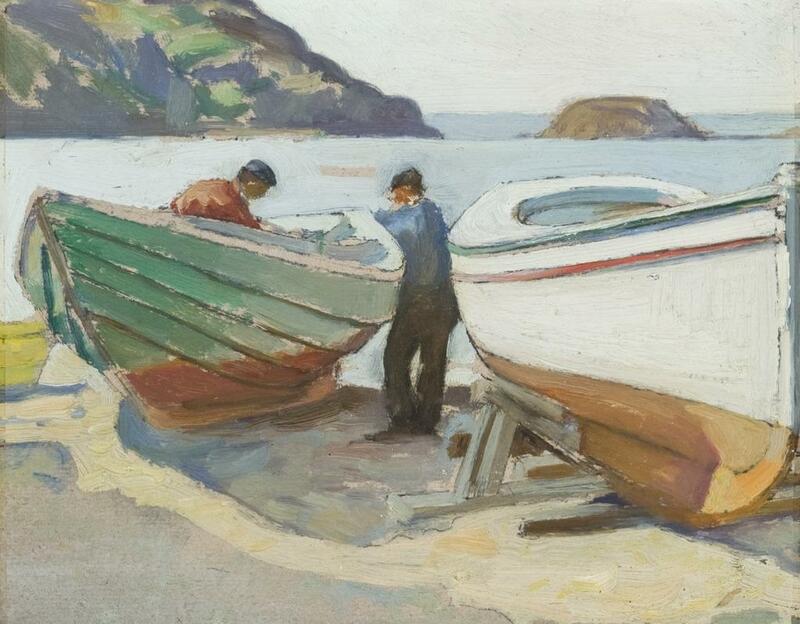 Hopper then handed Doc the small painting of him and Will Stanley next to the beached dory and Will’s working dory. As Hopper was still a struggling painter, he gave the painting to Doc in exchange for the medical treatment he had received the week before. It was not unusual at that time for artists to exchange paintings for services or store goods. Doc got a great laugh out of Hopper’s painting, and as soon as the piece was framed, it was hung on the wall at Four Winds. Edward Hopper’s oil painting, “Tredwell’s Folly,” remained on Monhegan Island at the Tredwell house until 2011. I had kept the Hopper painting in the same place on the wall where it had hung since the summer afternoon he brought it to my grandfather at Four Winds in 1919. 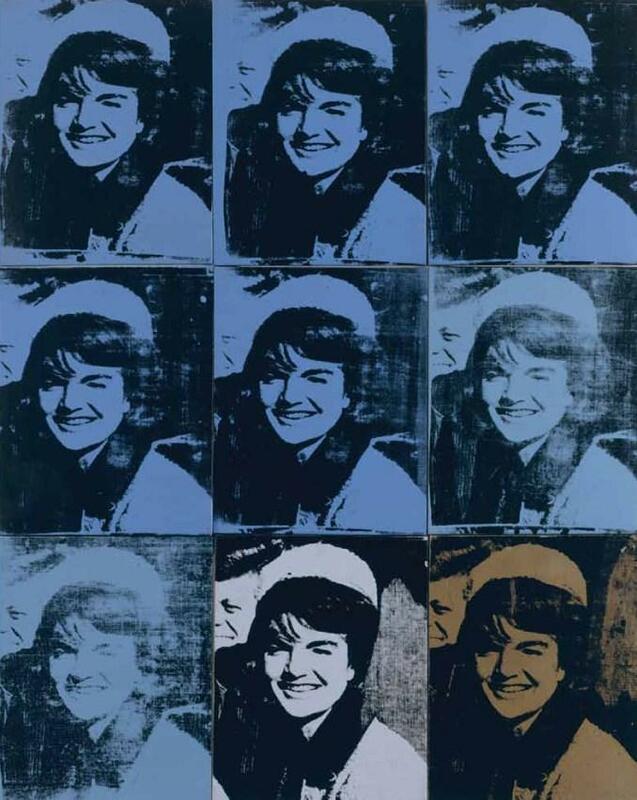 For decades, critics have observed that Andy Warhol’s influence is dominant in contemporary art, but as of yet no exhibition has explored its full nature or extent. Regarding Warhol: Sixty Artists, Fifty Years at The Metropolitan Museum of Art September 18—December 31, 2012 is the first major exhibition to do so through approximately 45 works by Warhol alongside 100 works by some 60 other artists. This innovative presentation, structured in five thematic sections, juxtaposes prime examples of Warhol’s paintings, sculpture, and films with those by other artists who in key ways reinterpret, respond, or react to his groundbreaking work. The exhibition shows the dialogue and conversation between works of art and artists across generations. Regarding Warhol opens with Warhol’s fascination and engagement with the imagery of everyday life in the section “Daily News: From Banality to Disaster.” His interest in commonplace or banal subject matter found in newspapers and magazines led him to create his early depictions of tabloid advertisements and press coverage of disasters. These works were clearly influential for other artists working at the time, such as Sigmar Polke and Hans Haacke, who took on similar subject matter. Key examples by younger contemporary artists such as Vik Muniz and Sarah Lucas are indicative of artists’ continued engagement with the news of the day. (Brillo Soap Pads Box, 1964) and its connection to later artists who appropriate objects from the supermarket or the department store, including Jeff Koons, Robert Gober, and Damien Hirst. 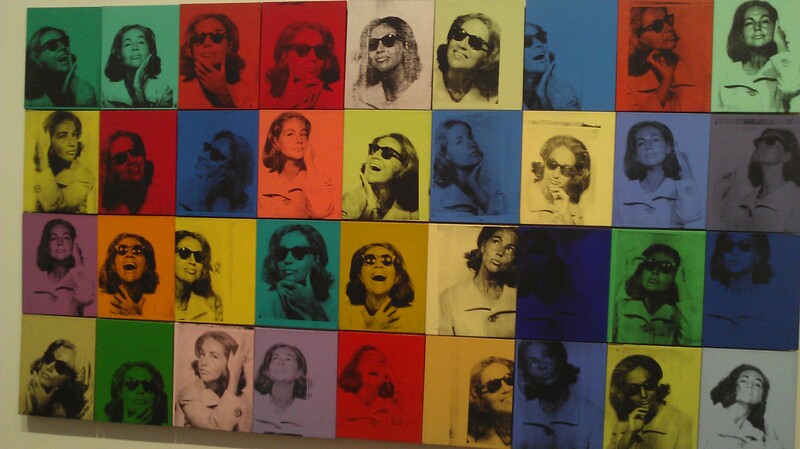 and Turquoise Marilyn (1964), are paired with contemporary examples by Elizabeth Peyton, Karen Kilimnik, and Cindy Sherman. Warhol’s portrayals of artists, poets, and musicians of his day are installed alongside similar examples by leading artists including Alex Katz and Chuck Close. Links between Warhol’s practice of society portraiture of the 1970s, as well as his artistic engagement with political figures (particularly Mao ) and the work of later artists, are also explored here. The exhibition’s third section, “Queer Studies: Camouflage and Shifting Identities,” outlines Warhol’s importance as an artist who broke new ground in representing issues of sexuality and gender in the post-war period. Warhol’s enigmatic persona developed over the course of his career is well represented by his last Self-Portrait (1986). In this work, made the year before his untimely death, his visage is concealed by a veil of camouflage. This iconic work opens a section devoted to frank representations of the male body that share their subject and composition with Warhol’s Torso from Behind (1977)—as in David Hockney’s Boy about to Take a Shower (1964) or Robert Gober’s Untitled (1990). This section also strives to represent a new openness toward different varieties of queer identity that Warhol’s oeuvre ushered in, largely through work by photographers such as Catherine Opie, Richard Avedon, Peter Hujar, or Robert Mapplethorpe. For the final section of the show, “No Boundaries: Business, Collaboration, and Spectacle,” Warhol’s interest in artistic partnership through filmmaking, magazine publishing, and design is highlighted. Also foregrounded is his fascination with creating environments that envelop the viewer entirely—the Gesamtkunstwerk of his all-over Flowers installations and his wallpapered gallery walls inspired other artists to extend their practice beyond the traditional spaces of the rectangular canvas into the world beyond. The works in this section range from Polly Apfelbaum’s floor-installed fabric piece, Pink Crush (2007), to a selection of Ryan Trecartin’s collaboratively created videos. Regarding Warhol: Sixty Artists, Fifty Years is organized by Mark Rosenthal, guest curator, with Marla Prather, Curator, Ian Alteveer, Assistant Curator, and Rebecca Lowery, Research Assistant, in the Department of Modern and Contemporary Art at The Metropolitan Museum of Art. The catalogue accompanying the exhibition includes an essay by Mark Rosenthal, 13 artist interviews by Prather, and additional contributions by Alteveer and Lowery. It is published by The Metropolitan Museum of Art and distributed by Yale University Press. For the duration of the exhibition, two of Warhol’s Ten-Foot Flowers (1967) from The Met’s collection will be on view in the Great Hall. Francesco Vezzoli's embroidery "Liza Minnelli,"
The Phillips Collection played a pivotal role in offering Washington Color School artists exposure to modern art. These Washington artists frequently visited the museum and found inspiration in the vibrant, light-filled paintings by Pierre-Auguste Renoir, Pierre Bonnard, Henri Matisse, Paul Klee, and, later, Mark Rothko. 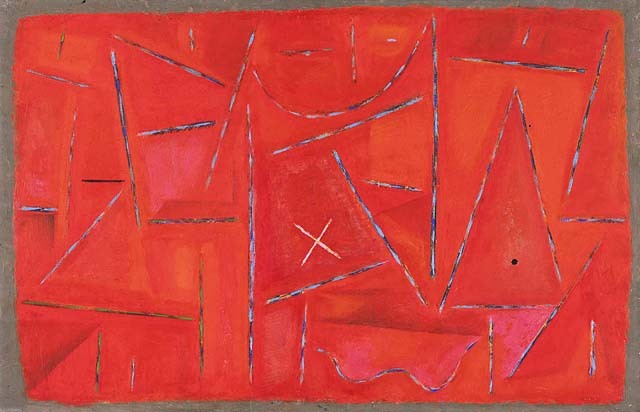 In celebration of the first major modern art movement to come out of Washington and the influential role of The Phillips Collection on its development, the museum displayed more than 20 Color School paintings and works on paper from April 14 to July 19, 2007. Lyrical Color: Morris Louis, Gene Davis, Kenneth Noland, and the Washington Color School was part of the citywide festival ColorField.remix. Arab Song (1932), painted directly on burlap, influenced these artists who would later stain raw canvas. Emphasizing the relationship between color, surface, and structure, Washington Color School artists experimented with a technique of staining the canvas, through pouring or painting, and used new materials such as thinned water-based paint and unprimed cotton duck canvas. The movement stylistically favored single image formats, all-over design, monumental scale, and, most importantly, expressive color. 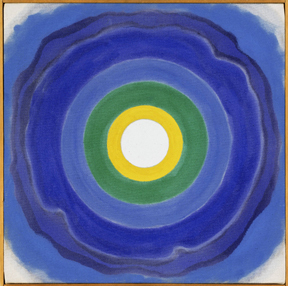 The radiating bands of color recall the life-giving force of the sun in Arthur Dove's Me and the Moon (1937), or Georgia O'Keeffe's Red Hills, Lake George (1927), both of which Noland saw at The Phillips Collection. Louis’ Number 182 (1961), from his well-known Stripe series, choosing to display the painting as a prominent example of contemporary art, in his recently completed Annex building. The Stripe paintings concentrated on the effects of overlapping, separating, transparent and opaque color, and in Number 182 Louis poured vertical bands into layered stacks. Depending on the placement and thickness of the paint, the stripes jostle, push and interact with one another. By manipulating a new acrylic called Magna, which was thinned with turpentine, color absorbed into the unsized and unprimed canvas weave, integrating material with support. Davis enjoyed spending leisurely weekend afternoons at The Phillips Collection, admiring the landscapes of John Constable, Gustave Courbet, and Chaim Soutine, and the color harmonies of Matisse, Bonnard, and Renoir. He was fervent in his devotion to the Phillips and attributed his mastery of color to the collection, saying "what constituted color in painting came directly from the French-oriented painting that Mr. Phillips seemed to be fond of." Davis never received formal art training, but rather learned about art through publications and collections. After experimenting with Abstract Expressionism, stripes began to appear in Davis’s work. During this time, Davis was influenced by other Color Field artists, as well as works by Klee that he saw at the Phillips, such as Botanical Laboratory (1928), and Tree Nursery (1929). 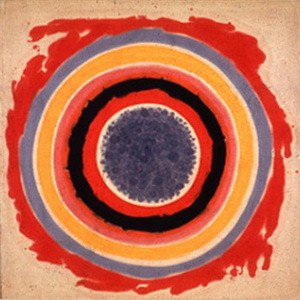 Lyrical Color: Morris Louis, Gene Davis, Kenneth Noland, and the Washington Color School honored the achievements of the Washington Color School Painters. More than 30 Washington area museums, galleries, arts organizations, and businesses will participate in ColorField.remix, a citywide festival of exhibitions, installations, and lectures. It was the largest celebration of painting ever held in Washington. 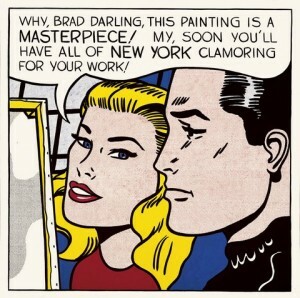 Pop art was defined, refined, and ultimately blown wide open by American artist Roy Lichtenstein (1923–1997). 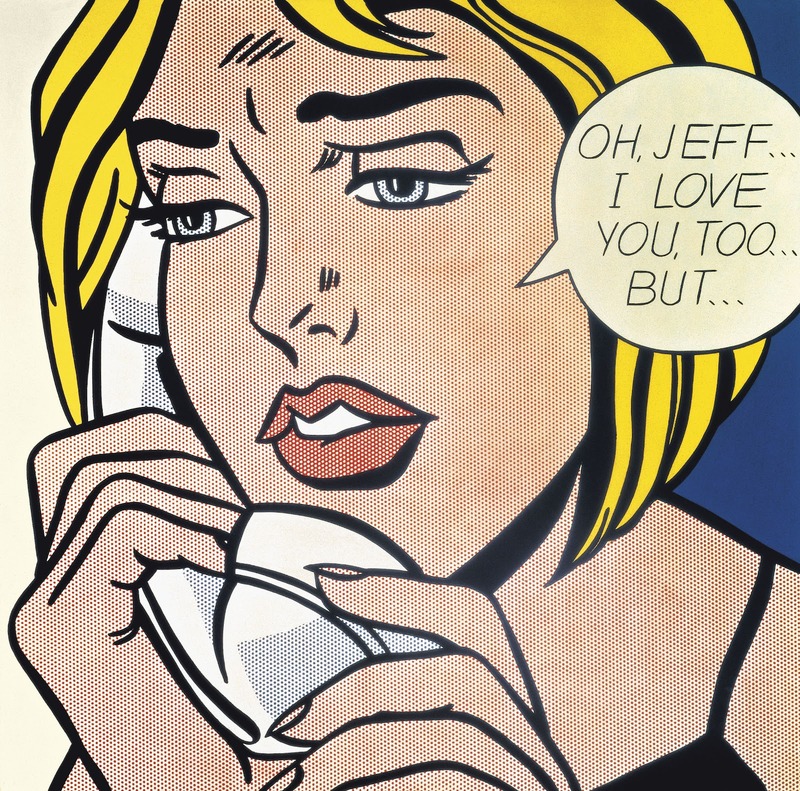 In the first major exhibition since his death, Roy Lichtenstein: A Retrospective will include more than 100 of the artist's greatest paintings from all periods of his career, along with a selection of related drawings and sculptures. On view in the East Building of the National Gallery of Art, Washington, from October 14, 2012, through January 13, 2013, the exhibition presents Lichtenstein's expansive legacy, including the classic early pop paintings based on advertisements and comic-book treatments of war and romance, his versions of paintings by the modern masters, and series including Brushstrokes, Mirrors, Artist's Studios, Nudes, and Chinese Landscapes. Hot Dog with Mustard (1963) are idealized versions of their real-life counterparts. We Rose Up Slowly (1964) and the violence of war in Whaam! (1963) point to stereotypical representations of gender in the mass media. Male protagonists—featured in dramatic close-ups in Torpedo…LOS! (1963) and Bratatat! (1962)—contrast with Lichtenstein's clichéd depictions of vulnerable women during moments of high tension. Self-Portrait (1978), the artist's face is replaced by such a mirror. Chinese Landscapes: Lichtenstein returned to the landscape genre in 1995, creating a powerful series of more than 20 works that appropriate motifs of the classical landscape painting of the Song dynasty (960–1279). In these highly stylized scenes, he recognized a painterly language distilled into codes and rules, and then translated this into his own style, seen in Treetops through the Fog (1996). Although Lichtenstein had been exposed to Chinese art as a student at Ohio State University in the late 1940s, the primary inspiration for this series was a group of monotype and pastel landscapes by Edgar Degas that he saw at the Metropolitan Museum of Art in 1994. The inclusion of a complete chronology of Lichtenstein's life and work—compiled by Clare Bell of the Lichtenstein Foundation—makes this catalogue the most authoritative publication on the artist since his death in 1997. The publication includes 172 color plates and is available in softcover ($45) and hardcover ($65). Related Article here and here.